Diagnosis: mTBI from seven concussions. First concussion sustained at age 15 from playing high school varsity soccer. Jennifer had her first concussion with loss of consciousness (a mild TBI) at age 15, while playing Varsity soccer. Her behavior radically changed after that and she became impulsive, depressed, and had frequent severe headaches. She received no treatment for her first TBI. She had four more mild TBI’s before graduating from high school. She struggled throughout college with daily headaches, difficulty sleeping, impulsivity, emotional problems, and difficulty thinking clearly. She had two more concussions playing recreational soccer. After that, Jennifer would experience the symptoms of concussion with only minor bumps to her head, such as riding a rollercoaster or bumping her head on a shelf. It became more and more difficult for Jennifer to think clearly. Her daily headaches became incapacitating. Her behavior was erratic and caused her great difficulty. She alienated her family and was in danger of losing her children. No one had ever treated her multiple TBI’s, although she had been seen in an emergency room with each one. She began getting treatment with NILT in 2013 after having two more concussions from minor bumps to her head. She sought out Dr. Henderson and was referred to Dr. Morries for NILT. After roughly 10 treatments, she noted more clarity of thought and her headaches had subsided. Her mood improved and her relationships with her family began improving. After 20 treatments of NILT, she got a great job, her relationships were much better, her emotions were stable, and she was making great strides. Now she is starting her own business, raising her children, and all of her symptoms of TBI have resolved. She also notes that minor bumps to her head no longer induce symptoms of concussion as they had prior to treatment with NILT. Diagnosis: moderate TBI from motor vehicle accident in 1983. Eric received a moderate TBI in 1983 as the result of a motor vehicle accident while on active duty. He was in a coma for two months and was airlifted from Europe to a rehabilitation facility in California. He had injury to his right temporal lobe and portions of his right frontal cortex. This was confirmed by his anatomical MRI. It also was evident on a perfusion SPECT scan. Eric experienced difficulties with speech and some difficulty walking. He complained of low mood, irritability, poor sleep, and frequent recurrent headaches. After 20 treatments with high-watt NILT, Eric showed significant improvement. His speech was much less garbled. In the subsequent months since treatment, his speech has improved further. His gait improved considerably. He reported improved sleep, improved mood, and resolution of his recurrent headaches. The patient was able to write and speak much more coherently. Two months after his last NILT treatment the patient had a repeat SPECT scan. Areas of statistically significant change are evident in both the left and right frontal cortices. Areas of statistically significantly increased perfusion in the post-treatment scan were also evident in the left and right temporal cortices. Notice the differences: SPECT scans of a patient before and after NILT treatment. Views of the brain from above (superior) are on the left and from the right side are on the right. Areas of light blue, dark blue, and black represent 2, 3, and 4 standard deviations below the patient’s mean cerebral blood flow. The area of anatomical damage is indicated by the light blue arrow. 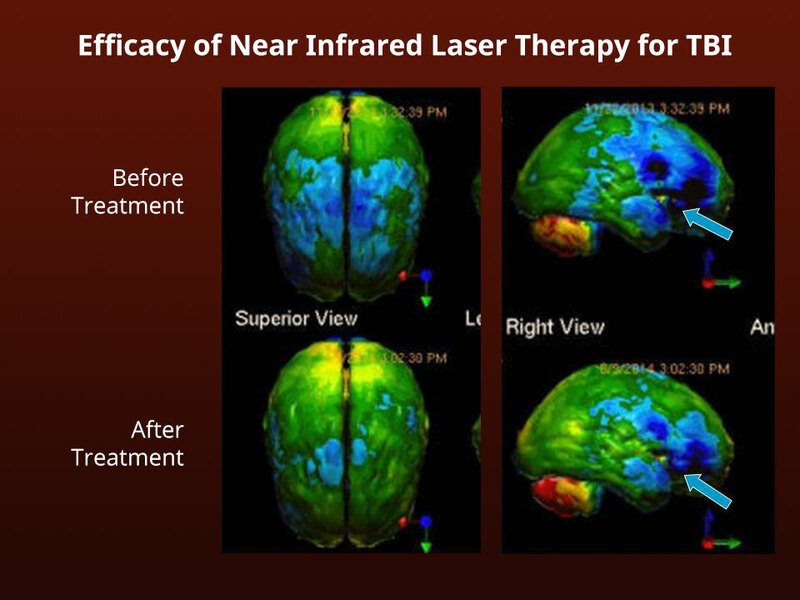 Areas surrounding the permanent lesion and also in the opposite side of the brain show improved function after treatment.